Over the past several months I have been slowly exploring Nepali food and cooking with rare items from our local supplier of foodstuffs from Nepal, Friendly Market on S. 7th St. in South Philly (see here for my 2014 introduction to that market). Every time I go in there I come away with at least one new ingredient or condiment that opens my eyes to a new culinary horizon. 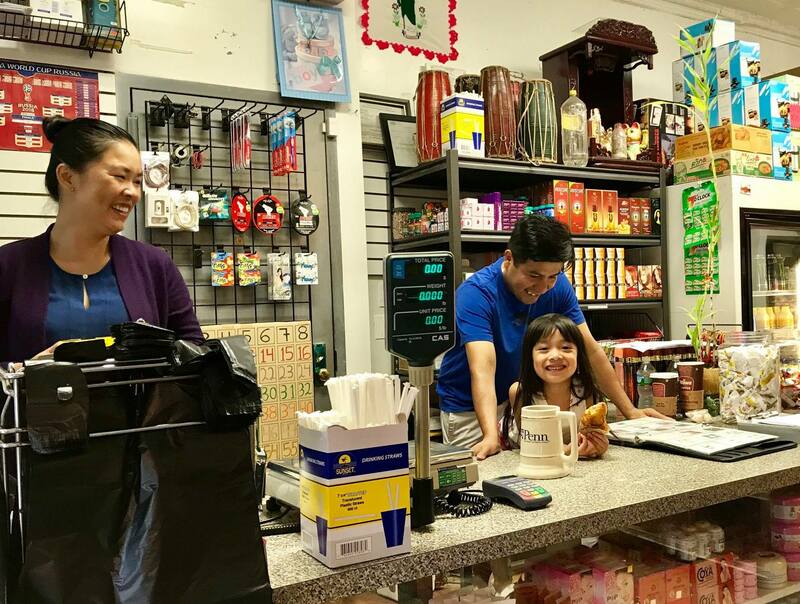 The shop owners Julio and Sovannary are always happy to talk about how their very specialized stock of ingredients can be used, and I always learn good things about Burmese and Nepali food when chatting with them. They have recently acquired some cookbooks to have on hand to help shoppers get a sense of how some of these exotic ingredients come together in Nepali and Burmese dishes (ask to take a look at them–they’re behind the counter). One very important Nepali ingredient and flavor that I have been obsessed with lately is gundruk गुन्द्रुक, a fermented and then sun dried mix of leafy greens (and sometimes roots). It is a very intensely flavored ingredient, full of funk and umami. Although the vegetables used to make gundruk are quite familiar to me (these are leaves and stems of saag vegetables: mustard greens, radish, cauliflower leaves), the taste of the end product is utterly unique. After the dried leaves are re-hydrated briefly in hot water, they can be used in salads or “pickles” (i.e. achar), and dry leaves can be added to directly to soups. When tasted, there is a slight “barnyard” flavor at the outset, followed by a heavy and addictive umami. In sampling this ingredient in soup preparations I am reminded of the savory pleasure of a great Korean soybean stew (doenjang jjigae) or Northern Thai stew with “rotten bean sheets” (see here for a past post on that item). As a salad/achar preparation I am reminded of the punch and tang of Burmese tea leaf salads (see here for my prior post on that item). Gundruk’s bold flavor would be perfectly matched with rice and some comparatively less flavor heavy sides of lentils. This important ingredient and food staple in Nepal is produced by fermenting leafy saag vegetables and/or roots for a week or more and then drying the sour vegetables in the sun. As you might imagine, high up in the Himalayan Mountains there is a relatively short window on a green vegetable growing season. Traditionally, this preservation technique helped to carry important vegetable nutrients into winter. That is still the case with gundruk, but over the years it has pretty clearly taken on important identity for food culture as a staple foodstuff for year-round cooking. Many talk about it as if it is a national cultural heritage. For example, I came across an interesting Nepali food blog by Prashanta Khanal simply called thegundruk.com–that might also give you a sense of the weight this ingredient carries in Nepali culture! I thoroughly enjoyed gundruk on my first try (which was as the soup above–see recipes in resources below), but I can image how the “barnyardy” smell may be a little off-putting to some. It’s kind of like fish sauce or shrimp paste is to uninitiated novices in Southeast Asian cooking. To those who brave the smell and try cooking with it anyway, you’ll know that the smell will takes a back seat as other bold desirable flavors move forward. This case is no different. Be brave and you will be rewarded! Over the past year there have been several videos uploaded to YouTube that explain the process for making gundruk. For a few nice examples, check out Chef Kunal Kapur’s informative video as part of his “nation of pickles campaign”. There is also a high quality multi-day video from harvesting to drying fermented mustard greens from Virtual Nepali. There are several food blogs and YouTube video recipes available online using gundruk. Most of those were for making either a type of gundruk soup or a type of gundruk “pickle”. Yummy Food World has very clear, high quality English subtitled videos for a gundruk soup with potatoes and soybeans, and a for gundruk achar. I’ve also been collecting Nepal and Himalaya-focused cookbooks to research and compare recipe patterns. Of the books, Jyoti Pathak’s Taste of Nepal is far and away the most definitive source for recipes and detailed information about Nepal’s culinary cultures. Her blog by the same name is also a treasure trove of images and information. The Nepal Cookbook is another favorite of mine. It is much simpler than Pathak’s work, but contains a nice balance of recipes. By the way, Friendly Market has a copy of Taste of Nepal too–browse it next time you’re in the neighborhood. In researching recipes for this dish I found a lot of diversity with preparation and spice. I settled on a combination of the ingredient list from my Association of Nepalis in the Americas cookbook and a video recipe by Yummy Nepali Kitchen. See below for an image of what I included. Clockwise from the bottom I had jimbu, timur (those can also be found at Friendly Market) and 2 dried chiles, fenugreek seeds (all three of those little cups would be my tempering spices in oil at the end of the recipe), about 1 cup of dried gundruk, mustard oil, turmeric, some cherry tomatoes and a few fresh chiles, dried soybeans, lime, and salt (not pictured–start with 1/2 tsp or so). Boil some water and steep the gundruk for about 10 minutes. Drain and squeeze water out and transfer it to a cutting board. Carefully feel around for tough stems and rip or cut those out. In a soup preparation this would be less important, but I really prefer not getting stuck with gundruk jerky. After tough bits are out, coarsely chop the gundruk and transfer it to a mixing bowl. Next, prepare your dried soybeans. Note: you can also “soy nuts” for this, and those wouldn’t need to be prepared further. If you are using dried and uncooked soybeans, they need to be fried them in oil until they are crunchy. I find this is best done on a low flame, rolling them frequently over about 10 minutes. Roast the tomatoes and chiles. I put mine under the broiler (sorry no image). Then remove skins of tomatoes and chiles. Mash those in a mortar and pestle. Finally, heat some mustard oil in a pan and fry the fenugreek seeds, jimbu, timur and dried chiles to impart those flavors to the oil and until fenugreek seeds are browned. Put all of ingredients (including salt and turmeric powder) into the mixing bowl and top with the hot oil and tempered spices. Mix, and taste for seasoning. Add lime juice and salt to taste. I also prepared some rice and black dal to accompany the gundruk pickle. For a recipe of that black dal, see here for my prior post on Nepal-style black dal. Food obsessed and frequently nostalgic. This entry was posted in - Featured Food Discoveries, - Featured Markets, - Recipes, Nepali food and tagged achar, เนปาล, 酸菜干, pickle, soup, soybean, 呢珀尔. Bookmark the permalink. And gundruk pickle is just so delicious!